London: European shares bounced back on Friday on expectations that some political developments in highly-indebted Italy and Greece would pave the way for tough austerity measures that are crucial to contain the region’s two-year-old debt crisis. Italy’s Senate is set to vote on a package later in the day, with former European Commissioner Mario Monti emerging as favourite to replace Prime Minister Silvio Berlusconi. In Greece, prime minister designate, Lucas Papademos, will name a new crisis cabinet to roll out austerity plans. Encouraging US jobless claims data and trade numbers in the previous session also prompted investors to buy shares. “A successful Italian bond auction and a sense that much needed political change is progressing appears to be aiding sentiment," Keith Bowman, equity analyst at Hargreaves Lansdown, said. “In the background, supportive US economic data and a broader conclusion that the third quarter corporate results season was by no means a disaster also appears to be playing its part. At 2:59pm, the FTSEurofirst 300 index of top European shares was up 0.6% at 969.24 points after falling in the previous two sessions. Banks featured among the top gainers, with the sector index up 1.2%, recovering after falls in the previous two sessions. The European banking sector is still the worst performer this year, with the sector index down 34% on concerns that massive exposure of banks to sovereign debts would severely hurt their balance sheets. Insurers were also in demand, with the sector index gaining 0.8%. Although equities made some progress on Friday, analysts said that the upward moves were not sustainable, and Europe faced several challenges on its journey to resolve the debt crisis that threatened a fragile global economic recovery. Citigroup said the new government in Greece suggested that there would be progress in the agreement of the second Greek bailout package and the disbursement of the sixth tranche of the first bailout package soon. “But, given that new elections are likely to take place in February 2012, political uncertainty in Greece is likely to stay high. This uncertainty also applies to the implementation of the required structural reforms, and austerity measures remain uncertain as well." With European leaders dithering over how to tackle the deepening crisis, pressure has mounted on the European Central Bank to act more forcefully. 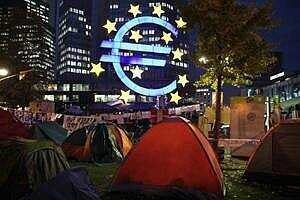 But three senior ECB policymakers on Thursday rebuffed pressure from investors. Focus remained on Italy and Greece where new governments would have a tough task to implement painful and unpopular austerity measures. “Having a change of hands at the top is probably a good thing for Greece and Italy, but it doesn’t change the necessity of passing the various increased austerity measures and it doesn’t really do anything about the weaker prospects of growth," said Richard Greenwood, fund manager at Bedlam Asset Management, which manages $700 million. “The new leaders face the same hurdles and those hurdles are increasing in height by the day. The only way out of these problems is to stimulate growth." He advised avoiding financial stocks, particularly those which had massive exposures to euro-denominated bonds, but added that the healthcare sector might offer good value if investors looked for good companies, such as Sanofi-Aventis, with specific catalysts to make earnings grow.